"This snack mix is a salty-sweet combination of everything you might find on the floor of a movie theater. I got this recipe from a co-worker and it is delicious!" 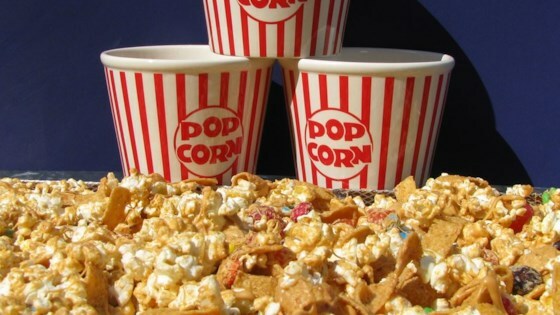 Mix popcorn, corn chips, candy corn, mixed nuts, and jelly beans together in a large bowl. In a microwave-safe glass bowl, melt the white chocolate chips on Low setting until barely melted, 1 or 2 minutes. Stir until smooth. Pour the white chocolate over the popcorn mixture, and stir to coat. Allow to cool, and break apart into small pieces. This sweet and salty snack is loaded with yummy stuff. It was SOOOO yummy, my kids love it. This is a great recipe for anyone looking for a easy, delicious snack!!!!!!!!!! I really liked this recipe becase it was easy enough the kids could help. We made extra and gave a couple small bags to teachers. Leave the packaged candy part out and it is even better.